In a perfect world, your house would be squeaky-clean every time you walked through the door. Unfortunately, such is far from the case, especially in houses with small children and pets. There are little that is more frustrating than purchasing a new carpet or rug for your home, only to have it ruined by stain the following day. Furthermore, not all stains are equal and knowing what kind of stain is present can help determine the equipment needed to remove it. The following guide identifies some of the more common stains that homeowners should be aware of. Water-based stains encompass a large amount of household carpet and rug stains. Water-based stains include beverages such as soda, beer, liquor, juices and milk. Water-based stains also include ink, mud and dirt, and paint. Water-based stains typically occur in the living room or bedroom, as both are among the most frequented rooms in one’s home. Oil-based stains are very common as well and are also a bit more difficult to remove than water-based stains. Oil-based stains include cooking oils, glues and adhesives, crayon, polishes, makeup, tars, waxes, butter and gravy. Given the increased difficulty involved with removing oil-based stains, upon encountering such a stain, homeowners should be sure to contact a professional immediately. Humans are not the only ones who can stain your rug or carpet. Pets, most notably dogs and cats, can often be the culprits as well. Homeowners are especially at risk of experiencing pet stains when the dog or cat is just beginning to learn when and where to relieve themselves. Even when pets are more mature, accidents can happen. Also if your pet spends a lot of time on your carpet, rug or upholstery, its odor can often seem into the material. We frequently deal with pet stains and odors, and are experienced in removing them. Other stains include blood, coffee and tea, and dyes, which are among the harder stains to remove. 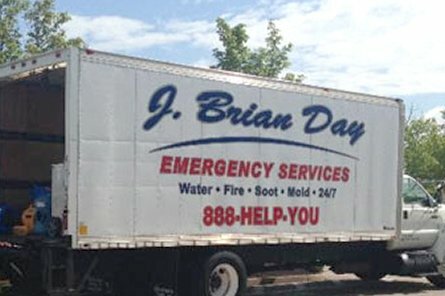 No matter the type of stain or odor present in your home, J. Brian Day can help! Contact us today for an estimate or to learn more about our services! Knowing which type of stain is present can help us treat and remove it properly. © 2019 J Brian Day. All Rights Reserved.